^ U.S. Census Bureau (2017). "Pop Culture: 1790". History: Fast Facts. Archived from the original on 2017-10-09. ^ a b c d Padover, Saul K. (1995). Landynski, Jacob W., ed. The Living U.S. Constitution: Historical Background, Landmark Supreme Court Decisions, with Introductions, Indexed Guide, Pen Portraits of the Signers (3rd rev. ed.). New York: Meridian. ISBN 978-0452011472. 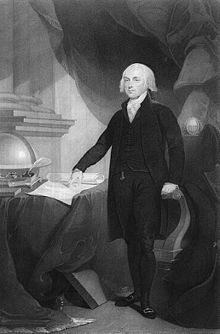 ^ The Debates in the Federal Convention of 1787 reported by James Madison : May 29. "The Avalon Project at Yale Law School". Archived from the original on 2017-08-15. Retrieved August 19, 2017. ^ a b "Meet the Framers of the Constitution". America's Founding Documents. U.S. National Archives and Records Administration. 2017. Archived from the original on 2017-08-27. ^ a b c d e "The Founding Fathers: A Brief Overview". The Charters of Freedom. U.S. National Archives and Records Administration. Archived from the original on 2016-10-06. ^ Webb, Derek A. "Doubting a little of one's infallibility: The real miracle at Philadelphia - National Constitution Center". National Constitution Center – constitutioncenter.org. Retrieved 15 October 2018. ^ Jefferson, Thomas. "Letter of Thomas Jefferson to John Adams, August 30, 1787". The Library of Congress. Retrieved 15 October 2018.